In 2013 the Institute of Informatics problems, Russian Academy of Sciences (IIPRAS) held the international testing – Testing of software products that implement technology biometric identification fingerprint. The IIPRAS testing was open, so that all manufacturers of biometric fingerprint identification technologies could take part in it. Such well known major companies as Safran Morpho (France), 3M Cogent (USA), NEC (Japan) took part in the testing. Sonda Pro, Intech and Biolink presented Russian developers. 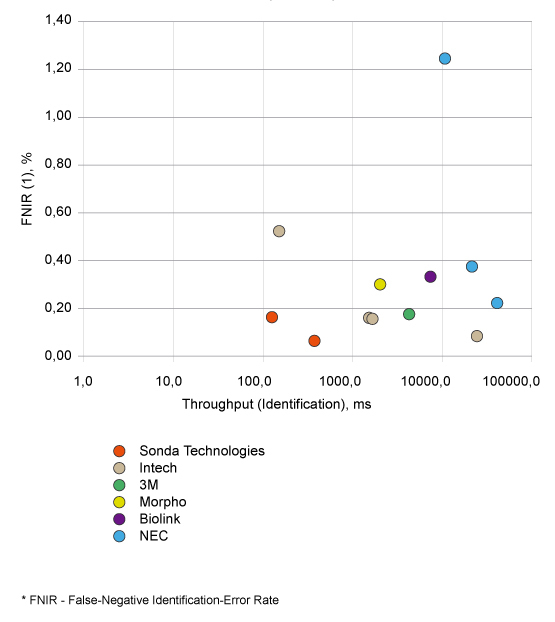 The Sonda’s identification algorithms showed the best results for a combination of searching speed and error rate. The main criteria for the identification accuracy formed the basis of testings. They evaluated the average identification time, average template formation time and identification error rates. So for testing Sonda submitted two algorithms. Both versions were good but the newer one with advanced searching accelerators showed the blazing performance in combination of indicators of matching speed and error probability. The first version had the average searching speed of 1.9 seconds on the database of 2 500 000 ten-prints. At the same time the second algorithm was much faster with 0.7 seconds while maintaining the same error rate. Such speed indicators are in line with the latest achievements of the world’s biometric leaders. Sonda © 2018 All rights reserved.